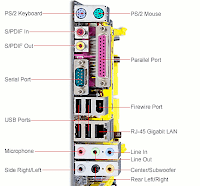 Basically every computer in the existence today supports several different ports. Without them our computing experience would be completely different. We use the ports to connect many external devices such as keyboard, mice, printers, scanners, speakers etc. These devices can be separated into two categories - input and output devices. Input devices signal a computer in a certain way. Mice and keyboards are common examples of input devices. On the other hand, output devices convert computer signals into a form readable by humans. Universal Serial Bus or more commonly USB port is probably the most popular port in the world. It is used to connect different computer peripherals such as keyboards, mice, external hard disk drives, smartphones, iPods, digital cameras and many others. Most laptops and desktop computers come with at least two or three USB ports. If you are not satisfied with the number of the ports that came with your computer, you can easily expand it by using a USB hub (USB HUB on Amazon.co.uk). The newest USB version is 3.0 (learn more about USB version 3.0 on pcworld), although many computers nowadays still come with USB 2.0 ports. The newer version is up to ten times faster; so try to buy a computer that comes with at least one new USB port, as it will help you get much faster speeds when you connect an external hard disk drive for example. USB 3.0 port is compatible with older devices made for previous versions so you do not have to worry about whether they will work properly. Does my PC have USB 3.0 ports? Video Graphics Array or VGA port is the oldest and probably the most widespread way of connecting your monitor to a video card or so called graphic card (what is video card used for?). It features 15 holes, and was designed back in 1987. The number of graphic cards and displays that support VGA has been dropping year-on-year, which is pretty understandable when you take into the account how old is this standard. Digital Visual Interface or DVI port was created in 1999, as a successor to the popular VGA port. Today it is one of the most popular ways of connecting your computer to a display. Most new graphic cards come with at least one DVI port, and often more, which enables users to connect multiple monitors. DisplayPort was designed in 2006, and represents the newest port that can transmit both video and audio data; however, it failed to reach the popularity of its predecessors. But, this will probably change as the time goes by, since DisplayPort supports much higher resolutions than VGA and DVI for example. Knowing that we can expect monitors with much higher resolution in the near future, DisplayPort will certainly have its role in the future as well. Watch this youtube video for difference between ports like VGA, DVI, HDMI and Display. Ethernet port is used to easily connect your computer to a high speed Internet via an external DSL/cable modem. Almost every desktop computer or a laptop has one of these ports, and data can travel at the speed of anywhere from 10 megabits per second up to 1000 megabits per second in case of Gigabit Ethernet. Firewire port was created by Apple and is available in their line of Mac computers since the early 21st century. This port is used to quickly transfer large amounts of data from a computer to an external drive for example. First version was able to transfer data at the speed of 400 megabits per second, while the newer version doubled the speed. These were truly impressive numbers in the time of USB 1.1 and 2.0 ports, but when USB 3.0 saw the light of day, it completely overshadowed the Firewire port.